I write historical novels and also some contemporary fiction. I am fascinated by the last century and the way both World Wars have affected the creation of new nations: The changing of borders, forced or voluntary movement of people and the resulting conflicts of loyalty and sense of belonging of my heroes. To portray this I usually create a large cast of characters whose lives are affected by the chain reaction of political and personal changes. My other, contemporary, fiction revolves around private dramas, such as mental and physical illnesses, mid-life crisis and choices we are forced to make in our lives. “The Luck of the Weissensteiners” is a novel set in 1933 Bratislava of what was then the First Republic of Czechoslovakia. It focuses on the romance between a Jewish weaver’s daughter and a German bookseller. As fascist interest in the country increases and war comes to Europe the couple and their families have to face the challenges thrown at each of them. After the War there are more unexpected circumstances to deal with. I have some family connections to the region and while researching the past of my ancestors I started to become particularly fascinated by the role that Slovakia played in World War II. 3. Part of a Series? “The Luck of the Weissensteiners” is part of a trilogy, which deals with the issues I have outlined above: Political borders, forced or voluntary mass movement of people and conflicts of loyalty and sense of belonging. The Trilogy is loosely entitled “The Trilogy of Nations”. The next part in the series has the working title “Sebastian” and is set in Vienna before and after World War I.
I first started writing at the age of 10 for my school’s student magazine, mainly comic pieces. In my late teens my desire to read got the upper hand and I abandoned my creativity in order to read more of what others had put together. I started again two years ago. I began to write a student manual for a course I was planning to give and got distracted by the idea for a novel. Curious to see if I could do it I persevered, expecting to lose my momentum before long. Only as I reached the 100 page mark did I believe that this story could turn into a book. My reason for writing that particular and yet unpublished book was my desire to share my personal experiences with mentally ill people, to alert people to the problems, heighten their sensitivity and become more tolerant, change their perspective. I am writing books of the type that I prefer in the hope that they will entertain others in the same way as I have been entertained and educated by great writers in the genre. In terms of other authors, I would have to say: Lionel Shriver, Simon Mawer, Christos Tsiolkas, Tom Perrotta and Patrick Gale – to name a few. Their honesty and bite when portraying their characters, their ability to create a love-hate relationship with their protagonists have fascinated me deeply and I am sure that some of their style has rubbed off on me. Being German and having learned Latin at school I am told that my sentence structure is reminiscent of Thomas Mann and other German writers, many of whom I studied in my teens and twenties. Other influences are of course my wonderful friends and editors. 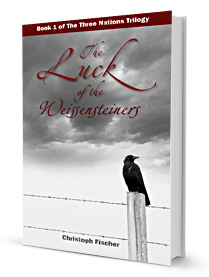 “The Luck of the Weissensteiners” is out on Amazon Kindle and CreateSpace print on demand in December. The second part of the Trilogy, “Sebastian”, and a book about dementia, are currently in the later stages of editing. I hope to publish at least one of them in 2013. A translation into German is currently also under way.